Science blends with art and writing in Spring Creek’s Long-Term Ecological Reflections (LTER) project at the H.J. Andrews Experimental Forest. Science blends with art and writing in Spring Creek’s Long-Term Ecological Reflections (LTER) project at the H.J. Andrews Experimental Forest. In 2004, Robert Michael Pyle, nature writer and scientist, served as the first LTER writer-in-residence. He focused on a 200-year-long log decomposition study. 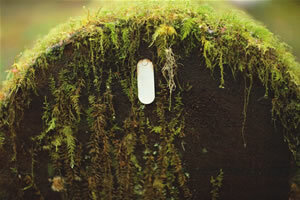 Its purpose: to understand forest cycles of growth and decay. Other participating writers have included Robin Kimmerer, author of Gathering Moss (OSU Press, 2005); Scott Slovic, writer, critic and educator; and poet Pattiann Rogers. The U.S. Forest Service co-sponsors the project.